Car 4404 entered revenue service on 510 Spadina just before 6:00 am today. This also marks the introduction of Presto! on the Toronto surface network. Later today, 4400 should join 4404 in service, and by Wednesday, December 3, 4403 is expected to be on the street as well. Delivery of additional Flexities from Bombardier has been slow because the TTC is insisting that quality control at the plant be improved, and they will not accept cars only to have them fail in Toronto during testing. 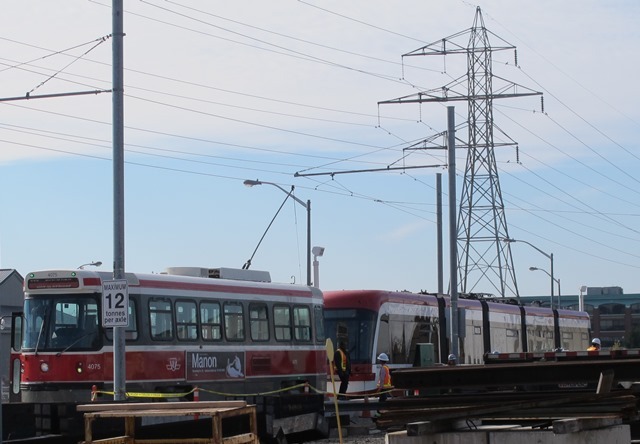 The TTC is also working with Bombardier to get the production and delivery rate up to a higher level so that the conversion of routes to Flexity operation can get underway properly. 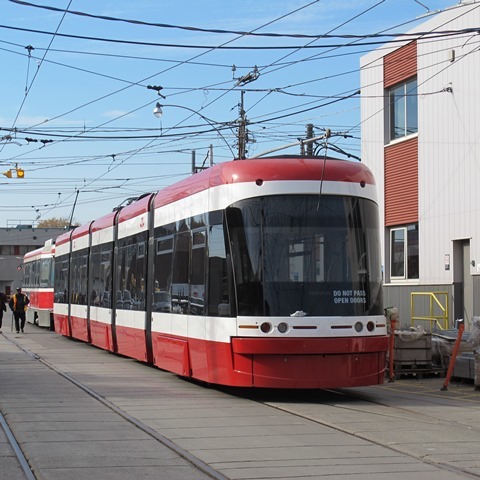 Meanwhile, as already announced by CEO Andy Byford, the coming 2015 budget will include money for renewal work on the ALRV fleet (the articulated streetcars used mainly on King and Queen) to extend their lives and retain their higher capacity during the transition to Flexity operation. 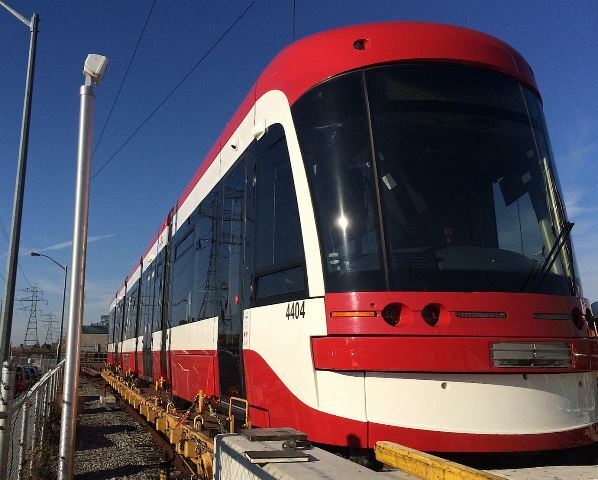 Car 4404, the second “production” low floor streetcar, has finally arrived in Toronto. The TTC still does not have an updated delivery plan for Bombardier to supply the production run of cars. Meanwhile, 4401 and 4402 continue operating as training cars while 4400 and 4403 provide revenue service. On a brighter note, Andy Byford recently wrote about changes in the fleet plan which will see ALRVs kept in service longer and more cars made available for service on King and Queen. The rollout plan may also be changed to advance the appearance of new low-floor cars on these routes. Photos courtesy of Harold McMann. CLRV 4075 tows 4404 from the delivery ramp to the shops. P.S. Steve, is it possible that the people who complain about the idea of a Yonge extension to Steeles do not appreciate the notion that the biggest reason to do this is because of the fact that Yonge is overloaded, in a way that Danforth is not. If the BDL was overloaded, I suspect that there would be a similar notion of extending the BDL 1 stop in each direction and thereby increasing the turn capacity. I expect that this would follow all other measures to increase capacity, and that capacity having been consumed (like on Yonge). Steve: The current fleet plan for the BD extension only allows enough trains for half of the service to go past Kennedy Station, and so there is, at least at this end of the line, already provision for a split terminal operation. Whether political winds will allow any trains to turn back there, or demand that everything run all the way to Sheppard, is quite another matter. I suspect this will be seen eventually much like turning a train at York Mills would be, too much trouble for those travelling beyond. I do not believe that most people appreciate the fact Finch ridership is essentially the same as Union’s (subway) and the latter goes in 2 directions, or almost 40% more than Kennedy (which I believe includes RT transfers). Also Steve is not the load at Finch more tightly focused in terms of the 2 pulses of rush hour than most of the rest of the system? Steve: Remember that the split terminal on Yonge would be in support of lowering the combined headway from 140 seconds to 110 or 105. This would make the headway at Steeles 210 seconds, yes, wider, but not 280. The basic problem is that unless a Steeles terminal is designed to support shorter headways, it will be physically impossible to operate service at that level. A clone of Finch Station will not work. I just saw on the CBC website that Bombardier’s laying off people in Thunder Bay. According to the article, the affected employees work on the bi-level and LRV production lines so I wonder if the low rate of production and delivery of the new streetcars is going to continue for some time. Steve: Yes, it certainly seems so. How it is that Bombardier cannot get its supply chain working properly is utterly baffling. With regards to this Steve, has there been anything further from Metrolinx with regards to service improvements on the Richmond Hill corridor, and where it sits in the priority list for additional tracks and flood proofing. This is where anything from the north should really connect, however, it will likely need to be really top notch service in this corridor to help much. Steve: Nothing new recently beyond the announced extension to Gormley..
Also, are we waiting entirely until the new Mayor has had his discussions and settled in or has Metrolinx given anything new in terms of the status of the Don Mills subway and a possible Don Mills LRT? Steve: Don’t hold your breath for a Don Mills LRT. It will be a hard enough fight just to keep interest active in the DRL as a future project after SmartTrack and the Scarborough subway, both of which were explicitly mentioned in the Mayor’s inaugural address. Meantime, getting back to the 4404 somebody needs to do something for the shoulders, so that those who don’t want to come from away, have some service from near. I know I have been a little over the top on the issue, but why can’t we actually do something about the waterfront LRT projects, especially the East Bayfront right now. When the bureaucrats are willing to around politicians, it is likely the evidence is fairly clear. If we are not going to move in a big way to make high frequency and capacity available in GO on Lakeshore West also need to look hard at WWLRT. This is really too bad. It seems fairly evident based on the growth of 416 and other 905 ridership (ie central York), that the Yonge subway is likely to get critically overloaded someplace around Sheppard. It would also seem that partly as a result of this, that a Don Mills Subway would do much more to relieve Yonge as it would permit some of the 416 riders to head south to the Crosstown and then to a Don Mills Subway. Also with a subway core to the Crosstown at Don Mills, a Don Mills LRT with a 1km or so stop spacing and really good signal priority would do more to relieve Yonge north of Eglinton than SmartTrack. This would permit diverting core bound bus riders before they ever reached the Yonge subway. It would also seem to me that the politics around subway construction mean that if SmartTrack is built there will remain a substantial political question (as opposed to real need) around why another core bound subway is required, as many of those most politically active in Scarborough will not be riding the subway at all (even though they currently believe subway is the only way). The regular comment of why would I not ride the bus a couple of extra minutes to avoid a transfer at Kennedy, will become a reality of why would I not ride the bus a couple of extra minutes to avoid the transfer at Yonge. However the issue at Yonge / Bloor will reassert itself even without their presence in a matter of a couple of years (if it actually does more than reduce its intensity at all), and the issue further north along Yonge will continue to grow. I fear those currently demanding subway in Scarborough and questioning it elsewhere, will remain sceptics, especially when they see their subway looking so horribly empty. Unfortunately political pressure and ridership based need do not seem to relate. Finch has as much in subway boardings and alightings as Kennedy and Warden together, and Sheppard is also busier than either Kennedy or Warden, as is Eglinton. The other thing is that as you note Steve, the logic behind a Yonge extension, is not to stretch service out to someone, but to increase the capacity along the entire line, which includes those currently using it by transferring from Bloor. Imagine in Scarborough @ Kennedy all of the load that currently arrives by bus, plus all the load that arrives from the RT plus all the load arriving by bus to Warden all coming to one station, by bus. That is the amount of load currently headed to Finch – by bus. Steve also in terms of the notions that have been put out in terms of the key components of a mobility hub, ie density, variety of forms of transit, developable space etc. is not Don Mills and Eglinton actually the very definition of such a space? If you have the CrossTown, a Don Mills Subway, and if you could find a way to link GO in Richmond Hill and bus and /or LRT, this could become both an important point of transfer and a very attractive area to work and even live. This while being the logical location in terms of space being available and location to actually link the north and east of the city and its core. There is space on roads to this point but not beyond (Eglinton quickly gets too narrow, Don Mills ends not too far to the south, Leslie ends just to the west of here) and the roads generally become narrow to the south and west of here. When I think about the space here, Steve, the way the city transitions here, it is easy to understand why you are so passionate about a major link to this point, as a substantial key to enabling future planning and routes. Steve: Yes, Don Mills and Eglinton is an obvious hub, although the Richmond Hill GO line is over 1.5km east of the intersection and cannot be reasonably considered to be part of that “hub” (it does not actually cross Don Mills until north of Lawrence). If we ever get GO service on the CPR to Agincourt and North Pickering, it crosses Don Mills a short distance to the north, but I’m not holding my breath for that line any day soon. *how much taxpayer money will be needed to prop up transit rail vehicle production in Thunder Bay. On a positive note, Alexander Dennis Limited will be setting up a new production facility in Ontario as part of their deal with Metrolinx to supply lower-height double decker buses. Steve: The article also clearly states that the problem lies in the parts supply chain, and that the employees will be recalled in January when this is sorted out. Good grief. I had no idea Toronto was using single-blade switches. Those are used for trailing-point switches (where two lines are joining), usually in spring-switch form, but they are completely unheard of for facing-point switches in this day and age. Does Toronto seriously still use them for that? When they replace the switches, surely they put in double-blade switches? Steve: Nope. Don’t forget that the PCC fleet ran just fine on them, as did the CLRVs that replaced them. There has not exactly been a burning need for the change, and given the number of intersections we have, a retrofit would take forever. This brings up a question which has been bugging me recently. Why do trailing-point switches in Toronto’s streetcar system have moving points at all? Almost all of the system is, and has been for some time, absolutely 100% one-way operation: each piece of track carries traffic in precisely one direction. I believe there are still pieces of track at Hillcrest that could be travelled in either direction but reverse-running is never used on-street. Of course long ago we had some double-ended cars so it was a very different situation. Is it to make backing up always take the car back along the track from whence it came? Steve: On rare occasions, cars reverse around curves, typically for an emergency turnback. Nope. Don’t forget that the PCC fleet ran just fine on them, as did the CLRVs that replaced them. There has not exactly been a burning need for the change, and given the number of intersections we have, a retrofit would take forever. Very…. interesting. The problem with single-blade switches is that it’s relatively easy, if there’s some sort of weight imbalance on the car or if the ground tilts due to subsidence, for a car to take the turn when the switch is lined for the straight route. The trucks (bogies) have to be very rigid in order to avoid this. The trend has been toward less rigid trucks in order to give a smoother ride… particularly around sharp corners. Accommodating single-blade switches could actually require rather expensive design changes in the cars. They’re extremely uncommon worldwide. It would be well worth replacing the switches with double-blade switches as the turnouts are being replaced, so that the cars which *replace* the Bombardier Flexities in 20 or 30 years don’t have to have special accommodations made for the turnouts. I rode 4404 twice yesterday and I do think it rolled much more smoothly over the special work at Dundas, Queen and King. The operator certainly took it slow and there was some rumbling but nothing like the up and down I experienced on the other flexity streetcar I took in September. There was a strange announcement from the operator on the first trip asking/telling customers to use the doors with flashing lights (unclear if he meant the buttons or the red LED warning lights) so operators wouldn’t have to open all doors. Supposedly if passengers were trained this way (yes he said “we’re training you”) this would help keep the heat inside on winter and air conditioning inside in summer. It seemed strange to hear (and it was a bit hard to make out). The operators also seem to be very active users of the public address system, giving info (“you can use all doors with me, no need to run to the front”) and suggestions (“if you’re in a rush, pay on board”) to passengers…One passenger even asked a friend if the streetcar was talking to him. The TVM’s are quite large but if boarding from the middle doors they seem easy enough to access. I can see the problem if boarding from the front or back doors. The front TVM on 4404 was working at 3 pm but not in service on the later trip (7:30 pm) so passengers had to walk to the one at the back. If TTC is not going to add printers to the front and rear modules then they need to add off board TVMs with PRESTO readers, and start adding signs and paint to the Spadina platforms to indicate where the TVMs, wheelchair ramp and bicycle space are on board the streetcars. Beyond that…I distinctly remember a “sofa-sized” wide single seat on 4401 and 4402 at last year’s Harvey Shops open house but I did not see it on 4404. Did I miss it or is that seat gone? Steve: The intent is that the door operation buttons would flash when the doors were enabled for opening, and passengers (either inside or out) would use them. This would avoid having all doors open for an extended period when this was not needed. As for the “sofa” seats, they are still there. I have seen three (smallish) people sitting in the 1 + 1.5 seat configuration. The problem with single-blade switches is that it’s relatively easy, if there’s some sort of weight imbalance on the car or if the ground tilts due to subsidence, for a car to take the turn when the switch is lined for the straight route. Has this been a problem for the TTC? If not, is that because the TTC cars have unusually-stiff trucks, or just because weight imbalance and tilting ground don’t happen much in practice?